Once you’ve found out how to choose a web hosting plan and got one, it is time for you to choose your domain name and start building a website. But before you jump into the website creation process, there are things or two that you may want to consider when you are trying to find a domain name. And I figured that a quick tutorial on how to register a domain name is just what you may need. To get a domain name is not a that complicated of a process, yet there are a number of things that ought to be considered. A while ago we’ve covered some of the things that you must take into account when claiming a domain name. Still, there are other factors, that weren’t mentioned, and they need to be. A domain name is only associated with one website. There is no option for two websites to use the same domain name. You need to register a domain name before you can use it. A large number of the domain names that contain meaningful words are already taken. The first domain name to be registered ever was symbolics.com. It was bought 4 years before the World Wide Web even existed. The 15th of March, 1985 to be exact. As of today, symbolics.com is a museum exponent, and a Web Museum at the same time. It is really quite an experience to write symbolics.com in your browser, and to click enter, knowing that this is the oldest .com domain name. The name that you choose for your website to be represented with is crucial for the success of what you are about to do. Of course, the traffic your site will receive, and thus, its success is dependant on other factors as well. Say, the quality of your content, and how well you are able to promote your website. It does matter how you’ll register the domain name. If the name is way too long, or you choose to register a domain name using a string of easy to forget numbers or/and letters, this will surely decrease the chances of your web success. To find a domain name you should decide on the approach that you will use to define the name. Brand Name – There are a number of ways to create a brand. You can use real words. Uber did it. You can use acronyms, like KFC, IBM, and BMW. Facebook, and AwardSpace, for example, are brand names built from two words. You can deliberately misspell a word, like Digg, Tumblr, or Fiverr. Or, on the other hand, you can invent a word, like Lego, Adidas (created from the first and last names of its founder – Adolf Dassler), Vodafone, and Pepsi, for example. Keyword/s in the Domain Name – When the SEO was born, and the first SEOs started to optimize their websites and content for a specific search, they used the so-called keywords-stuffing in the content but had more aces up their sleeves. One of them was to register a domain name with the exact keywords that they were trying to rank for. Like ‘wheretobuyshoes.com’ (non-existing domain). This is not the best practice if you are after a long-term success and brand awareness, but still, it’s something that could (theoretically) bring traffic to your newly created website. Words – if you are not after branding, long-term success, but rather you want to create something with the goal to sell it, to register domain names with one word in them is definitely an option that you should consider. In 2010 insurance.com was sold for $35.6 million. A year beforehand, in 2009, Internet.com was sold for the amount of $18 million. Hotels.com was sold for $11 million. You got the idea. Find a desirable word that you can make an interesting website with, and try to sell it. Your domain name could be the next most expensive one. ** The information about the domain name prices is from Wikipedia. Most Meaningful Domain Names are Taken! To register a domain name, once you found the name you want, you can go to our domain page, and search for the chosen name, and thus, check if it is available. 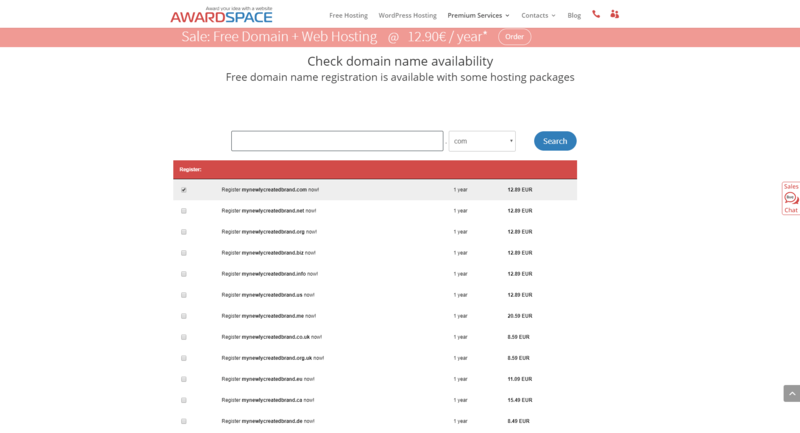 Now that, you’ve chosen the name, and the extension of your domain name, you will have to register an account with AwardSpace. You’ll have the option to choose your web hosting plan if you need one. And if you do, you can for any of our plans, including WordPress Hosting, and the Free Hosting. Having a domain name is worth more than the domain costs. Yet, if you are on tight budget, you can get a free domain name with some of our web hosting plans. We have optimized all of our hosting plans according to the specific needs of the end users. That’s why we offer hosting plans with free domains for life. Acquiring a domain name for life means that your brand is safe and secure. Get a Domain Name for Free!